HCM CITY – The Book Street Festival held in HCM City as part of its Tết (Lunar New Year) celebrations was a resounding success, surpassing expectations, organisers said. The festival, held on Mạc Thị Bưởi, Nguyễn Huệ and Ngô Đức Kế streets in District 1 attracted more than a million people and earned revenues of nearly VNĐ3.4 billion (US$149,000). Bestselling works included Nhân tố Enzyme (Enzyme Factor); Hoàng Tử Bé (the Little Prince) and Lịch sử khai phá vùng đất Nam bộ (History of Exploring the Southern Land). Publication houses that earned big revenues during the festival included Fahasa, Phương Nam and Phan Thị. 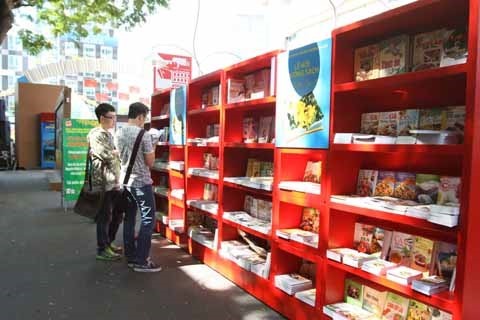 Another book street festival in HCM City, organised on Nguyễn Văn Bình Street over two weeks, attracted more than 100,000 visitors and earned revenues of over VNĐ1 billion ($44,000), double that of last year. The city’s flower festival, which ended Wednesday, was also a success, organisers said. With the constant flow of visitors, municipal authorities decided to extend the festival by one more day, until the fifth day of the Lunar New Year. This is the second time that flower festival was organised on the Nguyễn Huệ Walking Street. Organisers said no instances of flowers or plants being damaged were reported this year. The Nguyễn Huệ Flower Festival 2017 is jointly organsied by the city’s People’s Committee and Saigontourist.